The Coney Island Cyclone opened 82 years ago today. Astroland may be gone, but the Coney Island Cyclone just keeps screeching along (it was placed on the National Register of Historic Places on this day in 1991), celebrating its 82nd birthday today. It was originally built for less than $175,000 (or about $2.2 million in 2009 dollars), a fortune in 1927. The wooden coaster's first riders paid just a quarter for the thrill of zooming through the air over the beach. Rides now cost $8, but as part of today’s birthday celebration, the first 100 riders in line when the gates open at noon won’t pay a sheckel. Even better, “Cranky DJ” Michael W. Haar will be on hand (literally) playing pop and dance music from the early 1900s on genuine antique hand-cranked victrolas and phonographs. Beat that,iPod! All that, and you get to hang with Miss Cyclone herself, Angie Pontani of the retro-fabulous Pontani Sisters burlesque troupe. More information on the event at coneyislandfunguide.com. 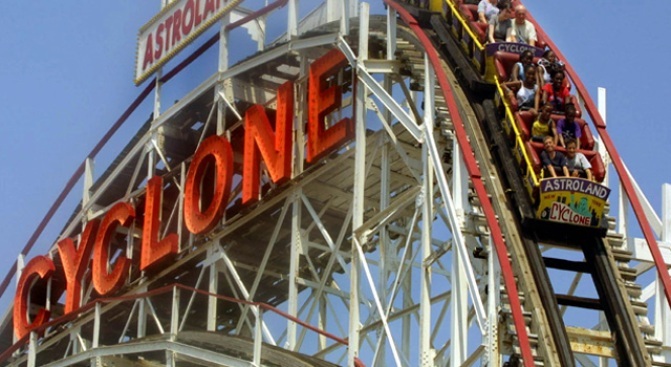 You can also learn more about the Cyclone itself at the Coney Island History Project.